By 1964, Muppet commercials aired around the country, Rowlf the Dog was a regular on The Jimmy Dean Show, and Kermit and others appeared frequently on The Today Show and variety shows. Starting in 1956, the Muppets made several appearances on The Tonight Show with hosts Steve Allen, Jack Paar, and Johnny Carson. Paar’s subsequent show, The Jack Paar Program, aired on Friday nights, and Jim and his characters were invited as guests five times. Jim, along with his colleagues Frank Oz, Jerry Juhl and Don Sahlin, went to the NBC studios at 30 Rockefeller Plaza on November 15, 1964 to tape the Jack Paar Program scheduled to air December 18th. The bit they planned, “Glow Worm”, was a staple for Jim, originally conceived in the Sam and Friends era. Kermit is harassed by a series of small worms that he proceeds to eat. A somewhat larger worm appears, and as Kermit tries to pull it into his mouth, it becomes apparent that the worm is actually the end of the long nose of a big and hungry monster – which proceeds to eat Kermit. While the act always got a huge laugh, what preceded the taping of it has gotten star treatment and has been formally celebrated by the historians at NBC. While waiting to do their act, Jim and his team opened an innocuous closet in the dressing room to find a maze of steam pipes and plumbing fixtures that just called out for decoration. Someone was dispatched back to their 53rd Street workshop to get fur, glue and paint. As the day wore on, Jim, Frank, Jerry and Don transformed the pipes into a population of crazy characters, signed the bottom “With Love From The Muppets” and shut the door. Over the years, those in the know showed others the Muppet pipes. Gene Shalit discussed them with Jim on The Today Show in 1980. When Jack Paar was a guest on David Letterman’s show in 1984, he took a surprised Letterman (and a television camera) back to see the pipes. Eventually Jimmy Fallon brought a camera backstage to show off Jim’s work. 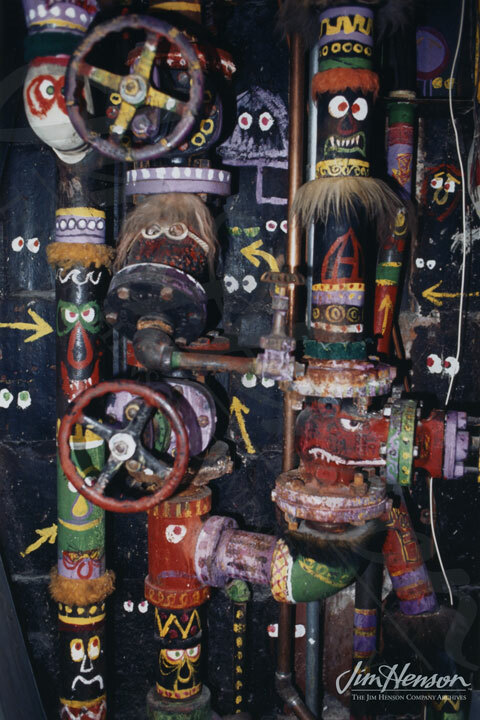 This led NBC to revamp the corridor outside the closet, add historical information and photos to the walls, and enshrine the Muppet pipes as an important stop on the NBC Studio tour. 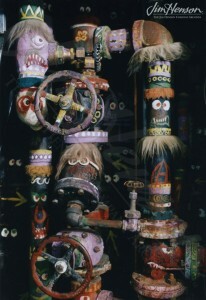 As Frank Oz said at the June 8, 2010 ribbon cutting, these fabulous pipes represent Jim’s “affectionate anarchy”. NBC coverage of the unveiling of the Muppet pipes on June 8, 2010. The NBC pipes decorated by Jim, Frank Oz, Don Sahlin and Jerry Juhl in 1964. Photo by John E. Barrett. 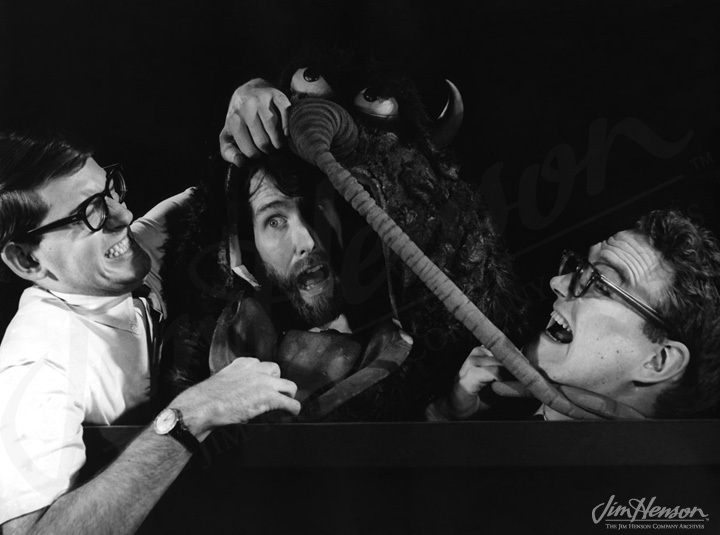 Frank Oz, Jim and Jerry Juhl with Big V, the monster from “Glow Worm”, 1964. This entry was posted in 12-December '64, 1964, Appearances and tagged Allen, Carson, Glowworm, Jimmy Dean, Juhl, Kermit, Letterman, Muppets, NBC, New York, Oz, Paar, pipe, Rowlf, Sahlin, Shalit, Today Show, Tonight Show. Bookmark the permalink.